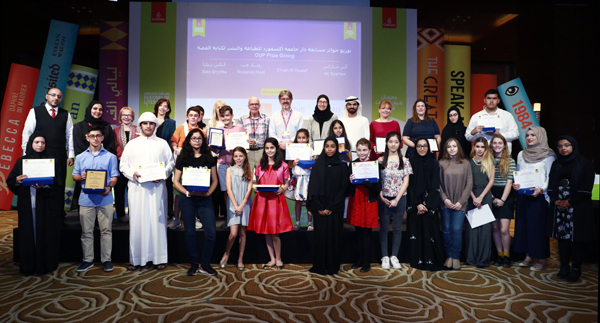 Oxford University Press Story Writing Competition Winners Awarded – Emirates Airline Festival of Literature. Dubai, 10 March 2018: The winners of the Oxford University Press Story Writing Competition were honoured at the 10th Emirates Airline Festival of Literature with printed books containing their original short stories and winner plaques. The annual competition has grown immeasurably since its inception in 2009, with almost 3000 students from around the GCC sending in their entries this year. The competition runs in Arabic and in English and is divided into age-specific categories: 11 and under, 12-14, 15-17 and 18-25. Presenting the awards at the ceremony this year were Festival 2018 authors Ali Sparkes (Thunderstruck), the writer-illustrator duo behind the Oxford Reading Tree books starring Biff, Chip and Kipper, Roderick Hunt and Alex Brychta, and Emirati children’s author Eman Al Yousuf.